Dwight Howard dressed up as a beggar who’d dance for food on Halloween. Let’s hope this isn’t a preview of coming attractions for Orlando Magic center Dwight Howard. The all-star tweeted pictures of himself in his Halloween costume on Sunday night. He showed the world that this 6-foot-11 NBA force was more than a little down on his luck. 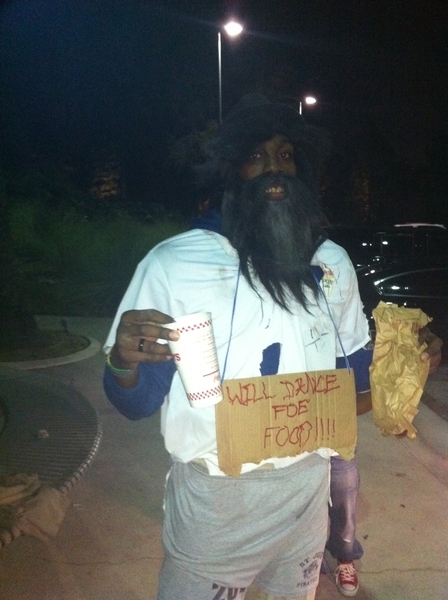 Hobo Dwight Howard wore a sign that said he’d dance for food. I don’t know about you, but I’m sure there are thousands of Orlando Magic fans who’d provide him a lifetime full of meals if he raised his free-throw percentage by 10-15 points. But as we all know, beggars can’t be choosers and Dwight Howard won’t have to beg for a meal anytime soon.